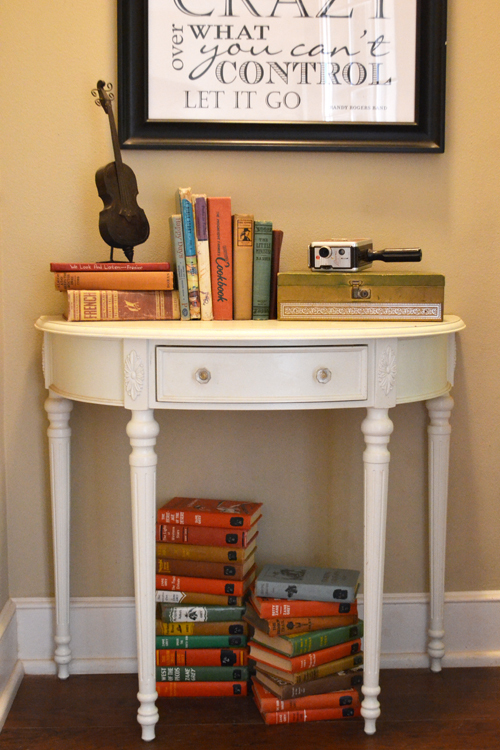 I admit, I have a favorite corner of the house… Ok, technically it’s a hallway (a teeny tiny one). It’s the 4×4 space that leads into the master bedroom. It’s not much, but I pass by it more than any other area in my home on a daily basis. Since I moved in, that “hallway” has been a work in progress. My friend Suzanne gave me the white table, and it happened to fit the space perfectly. I added a few knickknacks to the table and hung a blank frame as “filler” on the wall until inspiration struck. Now, that “filler” has become the most versatile decoration in my home! It’s actually just a pre-made frame from Hobby Lobby that I had glass cut to fit, and I add a new masterpiece (created in Adobe Illustrator and printed at my local FedEx office) whenever I get the itch! 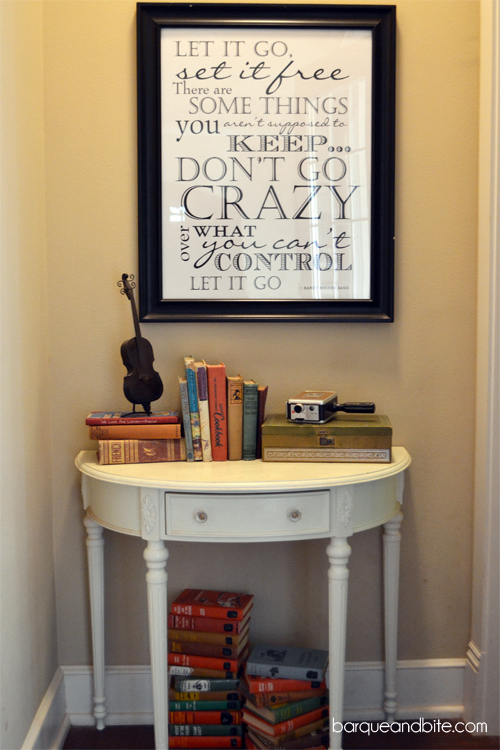 For “everyday” use, I enjoy a Randy Rogers Band quote from the song, “Let it Go”. It has sentimental meaning and keeps me grounded. 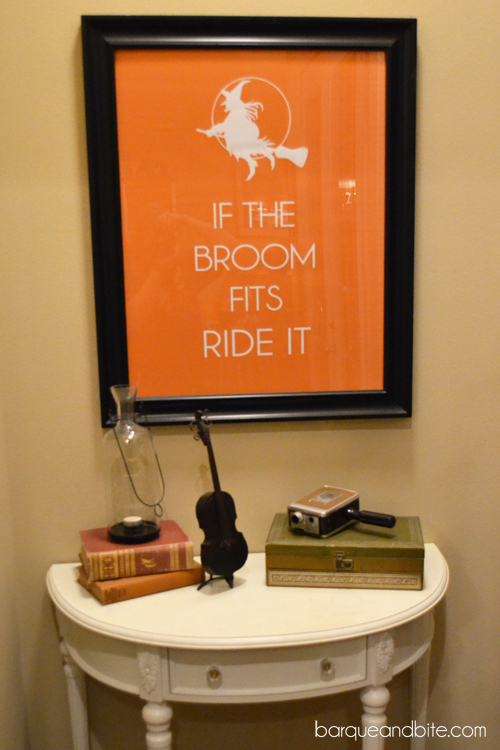 For Halloween, I swap the frame to display my “If the broom fits, ride it” artwork. 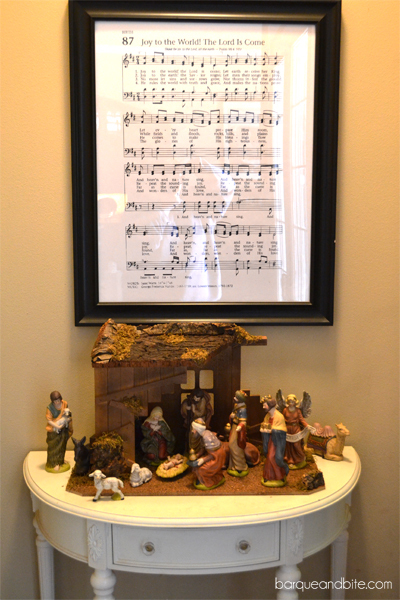 Over Christmas, I love seeing one of my favorite holiday hymns, “Joy to the World” enlarged on the wall. Eventually, I plan to have a design for every occasion and season, and a few extras for in-between. Who knew there could be so much flexibility in one empty frame? Over the past two years, the little table has collected a few more items- a wooden “violin”, a vintage leather jewelry box, and a Kodak Brownie Movie camera… along with more antique books (I can’t help but save them when I see them at estate sales). I never knew how much I could enjoy such a tiny corner of my home, but now that it’s a collection of items (and custom artwork) I love, it’s my very happy (small) space!